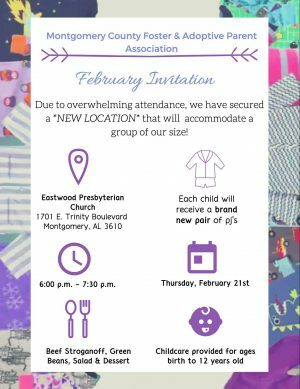 Montgomery County Foster & Adoptive Parent Association is proud to announce that their next meeting is hosted by Eastwood Presbyterian Church located at 1701 E. Trinity Boulevard, Montgomery, AL 36106. The meeting will be held from 6:00 – 7:30 pm on Thursday, February 21, 2019. Dinner and child-care are provided! Previous Post: « Would You Adopt a Baby With Down Syndrome in Alabama?